Why do I rage against the NFLization of college football? Look no further than Super Bowl media day — excuse me, Super Bowl “Opening Night” — the manifestation of each of professional football’s worst elements. The two weeks between conference championship games and Super Bowls are prime-time for parroted talking points and intellectually laziness. The Cam Newton-inspired volleys lobbed between media are 2016’s example. Super Bowl media day is the main event for this fortnight of foolishness, every bad impulse of The Shield condensed into a few hours. Crass commercialism; shrill attention-mongering; shallow content tailored to the lowest common denominator. It’s all here! But for whom does Super Bowl media day exist? Super Bowl media day isn’t for fans. The event’s taking on such a ludicrous identity, nothing of substance for followers of the teams will emanate from it. I asked a friend who covered the Super Bowl for a high-profile outlet his thoughts on media day. “The biggest cluster—- waste of time in sports journalism,” is how he described it. The mob scene of credential attention-seekers is such that the players don’t really need to be there. So, media’s day not really for media, either. Scratch that — it’s not for journalists. 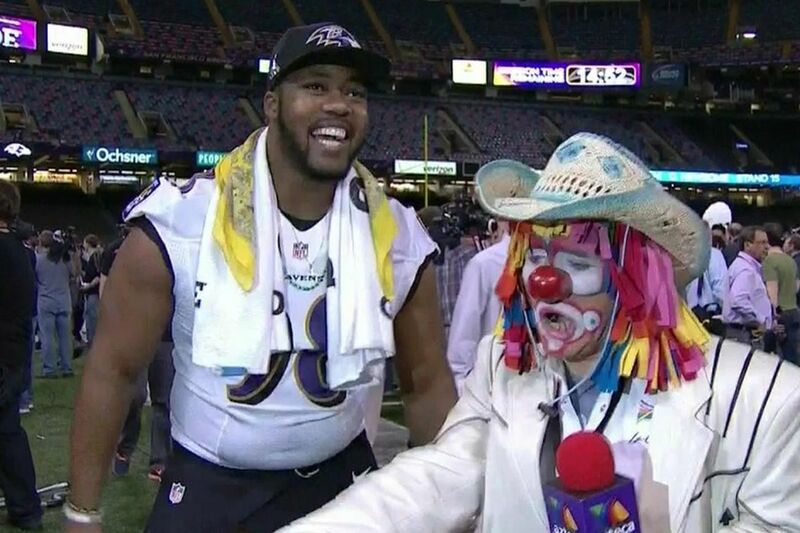 Those who attend Super Bowl media day looking like clowns — I mean that in the most literal sense — are technically media in that they represent a media outlet, and are presumably paid to be there. Though, that’s less of a requisite than it used to be. I would also venture a guess that any college football media day, practice or game I’ve ever covered would strip my credential were I to show up in an Ushanka, samurai armor and Jackie Onassis sunglasses. Super Bowl media day represents the apex of a phenomenon in sports media, coinciding directly with the NFL’s unprecedented boom in popularity. When Julie Brown reported from Super Bowl media day for MTV in the early 1990s, it was offbeat. It was cool. It was original. The cosplayers parading into Super Bowls in the years since aren’t any more original than the scores of nameless morning zoo radio shows that aped Howard Stern long after his own shtick had reached its expiration date. The oft-repeated adage about the NFL being a “copycat league” applies equally to personality-driven sports media. College football isn’t immune; anyone else sick of Houston Nutt memes knows to what I refer. Above all else, the gross commercialization of Super Bowl media day crystallizes my No. 1 beef with the NFL in its current state, which happens to be my primary concern for the direction of college football. Media day’s devolution into “Opening Night” was the inevitable destination. Any decision made concerning the NFL has the same driving factor. Charge fans admission to watch the circus, send a few NFL Network cameras there, bill advertisers for first-run content and BAM! A quick buck is to be made. I cringe any time college football’s leading voices advocate abandoning the game’s soul so that someone else can pad their bank accounts. Wait. Maybe I’ve stumbled onto a stunt worthy of Super Bowl XLI Opening Night.